Possibly Apocryphal – Page 3 – Where the sacred bleeds into the profane. It may not have happened, but it's all true. Please note: There aren’t any spoilers here—the new season of The Great British Bake-Off hasn’t yet aired. 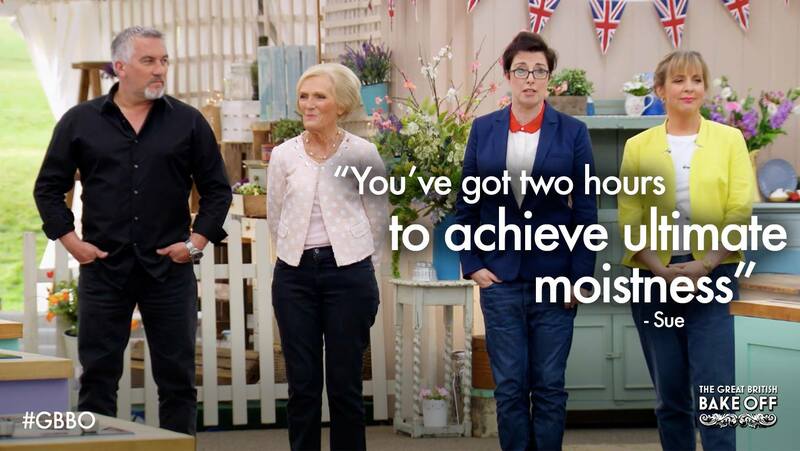 If you are GBBO spoiler-averse, in future, please avert your eyes. I was as disappointed as anyone else when The Great British Bake-Off jumped the Good Ship BBC for (still ultimately publicly owned) Channel 4. I just knew it was all over, this thing I loved—deep fatalism is so good about providing for instant, total, and complete resignation. Acute tristesse was actually pretty brief—after all, TV is merely TV, a primordial blob from which capriciously emerges both the nearly sublime and the abjectly awful. A most undependable medium. Besides, Channel 4 already seemed a friendly place to me, home as it is of Jamie Oliver, who I like a lot. And the salient fact is Love Productions created and makes GBBO, no matter who’s doing the broadcasting. We can visit with the lovely Mary Berry during her own BBC shows. So. 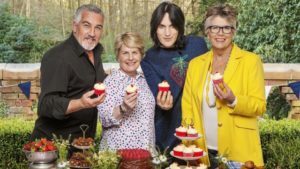 The first reviews are in—I’ve linked a few below—but I already had a little good anticipation after seeing the GBBO Season 8 trailer, with a Paul McCartney song and animated baked goods. The spot garnered a surprising amount of offended-sensibilities opprobrium in the foodsphere, but I found it charming all ‘round, probably from being raised on the freakazoid stop-action claymation of Art Clokey’s Gumby, and Terry Gilliam’s Victorian clip-art mini-monstrosities for Monty Python’s Flying Circus. I even have (measured) good feeling about the new cohorts for Paul Hollywood: years ago I picked up an excellent Prue Leith book at a used bookstore, I do not ignore that Sandi Toksvig has been vetted by the likes o’ Stephen Fry, and Noel Fielding was my favorite part of The IT Crowd. 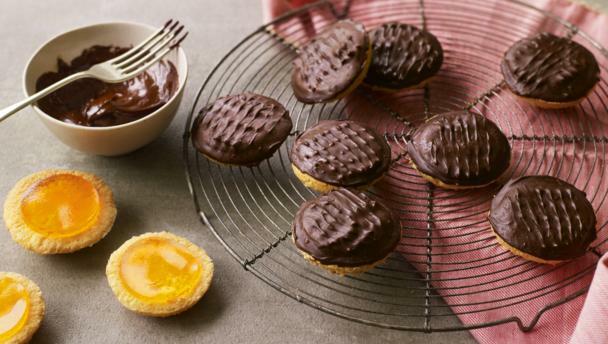 The best revelation has been the return of Extra Slice, the Jo Brand-hosted aftershow with cake-loving comedians, where the leaving baker is debriefed and audience bakes are displayed. Some reviews… the tl;dr takeaway is it isn’t ruined. My aforementioned fatalism will be the judge of that, however. Here’s The Guardian, Radio Times, and the Telegraph for those interested in pre-game due diligence. We call an overnighter a Mini Road Trip. So what about one that transpires completely inside of a single day? I submit: Micro Road Trip. In little more time than would be spent on regular errand-running, it’s entirely possible to see and do a lot of interesting stuff. In connection with a regular visit to the grandparents, a destination that by itself is a solid hour’s drive, we took a micro road trip. 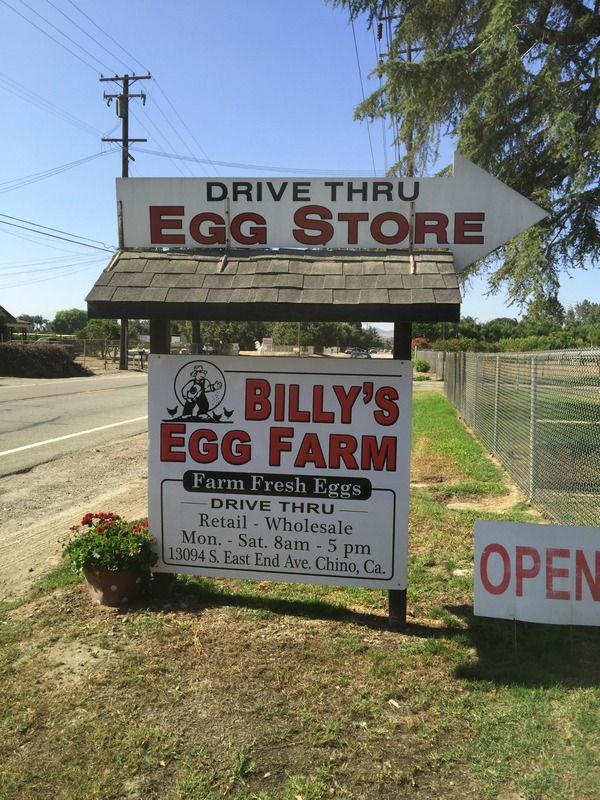 Spurred by needing eggs and more than need specifically wanting eggs from Billy’s Egg Farm in Chino, I checked and ascertained that a drive-by of drive-through Billy’s would add a mere 6 minutes to our travel. Seems an improbably tiny amount of extra time, but you know how numbers and distance are magical and weird, sometimes revealing surprises like that. A huge concomitant plus of this plan was the avoidance of the very worst part of the suburban-sprawl freeway grind—indeed, the drive instantly becomes good. And the bonuses keep on coming: Collaterally, this route makes possible a jaunt on Carbon Canyon Road, which passes through the mysterious community of Sleepy Hollow as San Bernardino County becomes Orange. 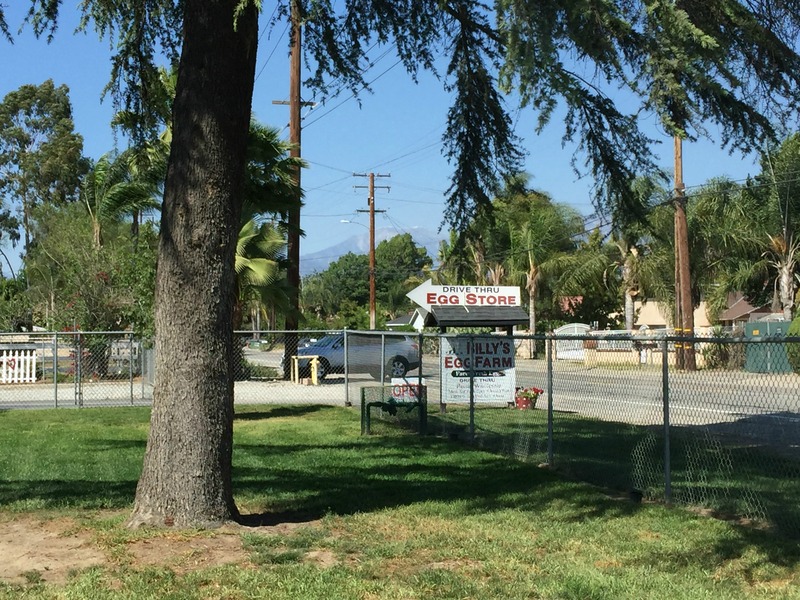 The next Carbon Canyon landmark a few miles on would have been La Vida Hot Springs, only it is no more. Its built environment, at least—no reason to suspect the natural hot springs aren’t still a-burbling. My La Vida memories are considerably more noisy and less health-giving than they would have been if I’d gone there to take the waters and indulge in spa treatments. For a short, lovely time, a teensy subset of the surrounding, larger-but-still-short late 1970s, a couple of ambitious Cal State Fullerton students put on multi-act punk shows at La Vida. The gone-to-seed health resort/biker bar—and I do mean actual bikers, not the craft-beer-swilling RUBBies who keep Cook’s Corner, our local canyon biker bar, in business, and God bless ‘em for that—turned out to be downright idyllic as a venue for all the best people’s favorite music. For some reason it was completely unsurprising that the bikers enjoyed the shows, too. Today, there’s nothing left of La Vida, nor of the mini, and, as it turns out, entirely ephemeral, world that produced punk. And what of Sleepy Hollow? It looks much as any of our California canyons, including the one in which I live. As a child I wondered who lived in the houses and cabins built in the style I grew up to call Canyon Vernacular, sited here and there on non-standard parcels along the curvy road. The whole place seemed mysteriously overgrown, quite a contrast to the suburban front yards I saw every day with their bloodlessly manicured juniper shrubs. Up close, junipers are prickly, awful, welt-raising things, whether carved into spheres, cones, or cubes. My family’s front yard was blessedly juniper-free—maybe the Japanese owner of Sandan Nursery, from whom my Dad got his landscaping advice and supplies, didn’t favor them. As an older teenager, I heard that Sleepy Hollow was a place where Orange County gay people felt comfortable living. I have no idea if this is in fact true, but however improbably Brea was always quite a bit gayer than the other small cities surrounding it. Other than that, it really doesn’t have much going for it at all. I was able to conclude at a very young age that it was clear most gay people want what most people in general want: a job, a home, a quiet life. And, God knows, Brea was so up to providing the latter. Anythewho, micro road trips. 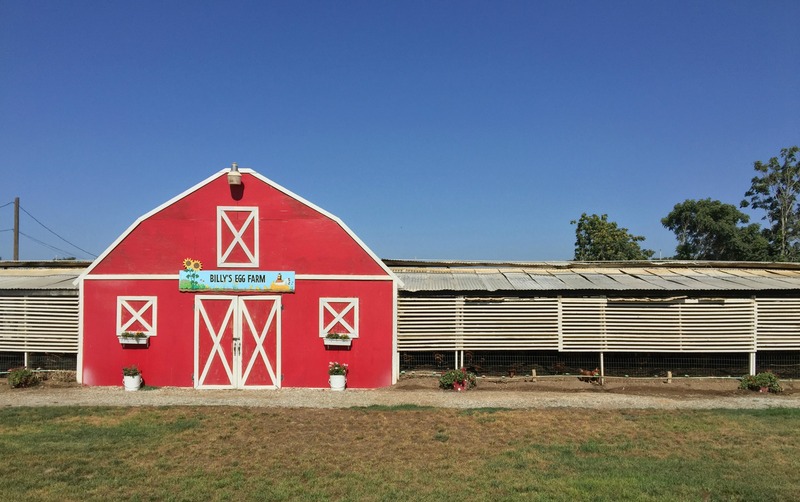 My infatuation with Billy’s Egg Farm is the result of an odysseggy or eggyssey (we’ve tried both on for size), a micro road trip on the topic of eggs. We visited a whole slew of egg ranches in the great Inland Empire, and Billy’s was the winner in a walkaway, or rather a drive-through, and not just because we happened to get Billy his own darn self at the window only too glad to expound on his chickens, 80 percent of which are cage-free, and of course the rest in the expanded cages required by California law. Billy’s eggs won because they were so far superior in taste and freshness, it’s not even funny. 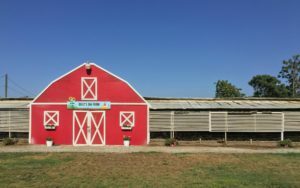 We quickly came up with several scenarios for working a Billy’s stop into daily life, in addition to grandparent visits: driving in from the desert, driving to the nearest, only-in-the-I.E. Baker’s Drive-Thru for one of their excellent burgers, driving to… buy eggs. 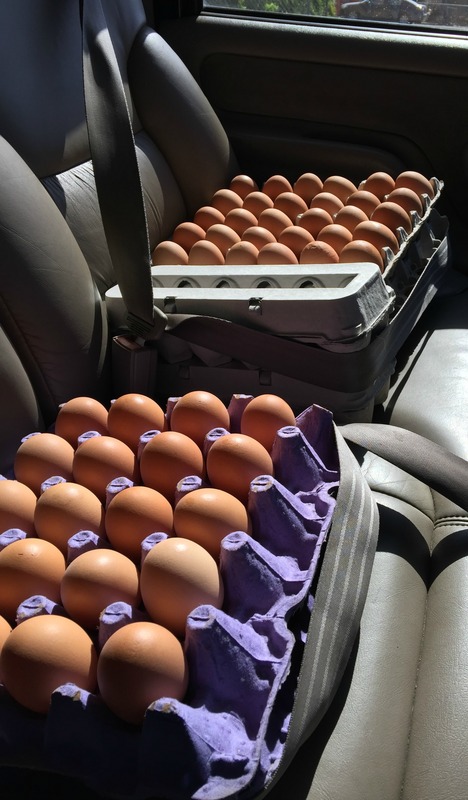 Great eggs are their own raison de road trip.